This website is developed by TellTrail Enterprises Limited in order to provide members with free to use, privacy-assured, ad-free social media facilities. TellTrail.com was built on the principles of Privacy by Design and Privacy by Default. This policy explains what information we collect, how it is used and how long it is kept. Whilst using this website you accept our Terms and Conditions and request us to hold, handle and process your data according to the privacy options you select. If you do not accept – or are below the age of consent (16 years) for - these terms and conditions then you must cease use of the website and, if previously registered, you have the right to request deletion of your account at data_protection_officer@telltrail.com. We may offer a facility for responsible adults to sponsor under-aged accounts where that recognised adult can commit and consent on behalf of a familiar minor. In such cases the minor account is considered an extension of – and supervised by - the adult membership. This policy describes the choices available to you regarding our use of your personal information and how you can access and update this information. If you have questions or concerns regarding this policy, you should first contact us at data_protection_officer@telltrail.com. This is the author identity label we attached to all of your postings except Advice Requests which we maintain as fully anonymised. Your choice of screen name must be unique in our systems, should not reveal your true identity (unless you are a public figure) and must not falsely represent you as a public figure, another real person or a copyrighted entity. The screen name remains the property of TellTrail.com and is usage is granted subject to availability and strict compliance with our Terms and Conditions. We reserve the right to alter or withdraw any username suspected of being offensive, plagiaristic or non-compliant. Your email is our primary means of identification and our only way to contact you outside of your website membership. It is used to request confirmation of your account control requests and also to provide regular external notification of relevant activity as defined in your Account Settings. This primary email address is also used to pay commissions and/or cash prizes and, should you subscribe to premium services, to collect subscription payments through the PayPal system. You must provide a valid date of birth (and certify to its accuracy) so that we can ensure your legal eligibility to enter into our Terms and Conditions contract of service. Legal minors (currently aged under 16) will be accepted for membership only if sponsored by an adult who commits to our T&C’s on their behalf. The website defaults to displaying gender-specific avatars until and unless you provide profile photos. You are free to select “Not Specified” so that a gender-neutral avatar is selected. You are at liberty to choose any valid ‘home’ location but please note that, for your browsing convenience, many of the website features automatically relate content to your registered home address and these features – distance calculations etc. – are enhanced by reference to accurate location details. However, except for businesses and charities promoting their premises, NO specific address details - only your Country & Town – are ever shown in published postings. You may elect to upload your own choice of Profile Photo(s) to replace the default avatar and give more character to your postings but your Profile Photos must not falsely represent you as a public figure, another real person or a copyrighted entity . Please remember that Profile Photos – if you choose to upload them – are available to PUBLIC viewing so that, unless you are a public figure, we strongly recommend using anonymous images. A range of royalty-free images are available for your use under the “Stock Images” section of image selection. If you choose to upload Cover Photo(s) you can specify who is allowed to view these items so you can be confident in personalising your profile with personal cover images. This additional contact information is optional but may help in the event of queries or problems with your account and would enable SMS contact where applicable. You are encouraged to provide an alternate email address in Account Settings for backup purposes but this is entirely optional at your discretion. This can help Customer Services respond to your potential queries in a personal way but its main use is – if you allow other members to search on your name and to make unsolicited contact – for lapsed acquaintances to get back in touch. Your optional Hi-Line text is displayed alongside your profile on member displays. If you specify a number of interests – and also allow other members to search your interests and to make unsolicited contact – then you’re open to being contacted by other members of similar interest. Your Profile Privacy Settings allow you to specify the privacy for all of the options asterisked above. Upon registration these options are initially set for PRIVACY BY DEFAULT (see below) but any changes you make to these privacy settings are immediately enforced for your convenience. Members are encouraged to add their own content (data, images etc.) into TellTrail.com and we host all such content in trust, i.e. responsibility for the ownership, accuracy and legitimacy of that content remains with the posting member. Members must select the sharing privacy and, where appropriate, circulation required for each piece of content and we undertake to restrict viewing to the selected audience and to prohibit any unauthorised distribution or access. We do however reserve the right to suspend or delete any content suspected of non-compliance with our Terms and Conditions including violations of intellectual ownership or copyright. Members are encouraged to comment on, or respond to, other members’ postings and to give feedback on their purchasing experience with business members. Your Account Settings data are held for the duration of your account from Registration to Deletion* and used entirely as specified above. 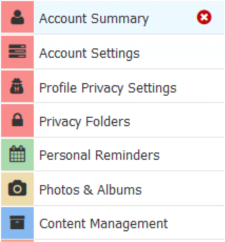 Profile Privacy adopts PRIVACY BY DEFAULT and Posted Data is made available according to the Privacy options you must set on posting (PRIVACY BY DESIGN) and remain available subject to content-specific retention (see below). You may wish to recommend membership to others, either by direct invitation or by inviting them to enjoy a particular item of content. To this end, we provide personal links that you can include in your own messages or – acting as your agents – we will forward your invitation to email addresses you select and provide. These email addresses are held solely for the purpose and duration of the invitation process (see below) and are not used or shared in any other context. You can make or accept CONTACT requests with any accessible Personal Member through the website and anyone accepting Personal Membership via your External Invitations automatically shares CONTACT status with you. Note that CONTACT status – once accepted - is always 2-way, i.e. each is a CONTACT of the other but neither is assigned any automatic privileges except to “see” the other through the Website. Business and Charity Members can accumulate a CONTACT list of Personal Members but this is only – and unconditionally – established when a Personal Member initiates contact (message, response etc.) with the Business/Charity account and/or adds the Business/Charity to their Personal Directory. Personal Members only see their Business/Charity CONTACTS through their Personal Directories whereas the Business/Charity can see Personal Member CONTACTS through normal Contacts & Friends control. With complete flexibility, CONTACTS can be added into various FRIEND Groups for easy reference and potentially to assign extra Privacy Access although neither CONTACTS nor FRIENDS have any inherent privileges except to ‘see’ that each other’s accounts exist within the website. You have the ability to dynamically make and/or break CONTACT and FRIEND relationships and even some post-publish Privacy Settings (see tour: Privacy Folders). NO history is kept of these changes. Once you have posted an item of content (other than a photo album) for others to see then the nominated audience cannot be reduced and the item’s published content cannot be edited. It is allowable for the author to increasethe nominated audience and/or to add an Addendum to the published content. Any other corrections can only be implemented by UNPOSTING and re-submitting the article. Content is only accepted for publication strictly subject to our Terms and Conditions which preclude offensive or otherwise unacceptable material. Every Member viewing that content has the right and the option to Report it to website administration for review and possible action. Such reviews will be prioritised according to the type and frequency of alleged offences but will adhere to a zero-tolerance, fail-safe policy whereby suspect material may be automatically withdrawn from publication and quarantined pending a decision by website administrators. The website – and your usage of its facilities – is governed by UK/EU laws and requirements including the EU General Data Privacy Regulations effective 25th May 2018. We may provide your contact detail to companies that provide services to help us with our business activities such as offering customer service. These companies would be authorized to use your personal information only for the purpose of and for as long as necessary to provide these services to us. Unless specifically prohibited by subpoena or equivalent legal process, member(s) affected by the disclosure will be immediately (within 24 hours) notified by internal and email messages. We do not make your contact or other personal information available to other users that you transact with on this site except within the parameters of information you provide and the privacy parameters you have applied. At your own discretion you should only disclose such contact information at a time and in a manner required to help complete the transaction. You can optionally import from your own external email lists to target sharing invitations. This process is subject to your own security and imported emails are used exclusively for the purpose of issuing invitations on your behalf. Recipients have the option to unsubscribe their email address which in any event will be deleted when invitation expires. Certain prizes and commissions may become payable through your website activities. If these require a cash payment we will send it as a PayPal credit to your registered email address. We do not and will not allow your personal information, browsing history, profile or other account-related data to be made available to external advertisers in any form whether specific or aggregated. Members have the right to view all account details and account content held on their behalf. Automatic Download facilities are a work in progress, meanwhile such requests should be addressed to admin@telltrail.com and will be serviced within 7 days. Members have the right to close their TellTrail.com account, such action is immediate and irreversible. Members have the right to publish, unpublish or DELETE* any of their own content and general control facilities are provided via Content Management. Edit facilities are provided, but to preserve integrity, published content cannot be altered nor have its audience reduced. Appending and addendum and/or extending the selected audience are allowable, otherwise an erroneous item must be unpublished before editing. All of each member’s site content is managed via Content Management but some items will expire and no longer be of relevance to the website. We will retain your information for as long as your account is active or as needed to provide you with services. If you wish to cancel your account or request that we no longer use your information to provide you services then contact us at customer_services@telltrail.com. We will retain and use your information as necessary to comply with our legal obligations, resolve disputes, and enforce our agreements. You control your notifications preference in account Privacy Settings. Should you experience any difficulty you can contact us at customer_services@telltrail.com. Our Web pages contain electronic images known as Web beacons (sometimes called single-pixel gifs) and are used along with cookies to compile aggregated statistics to analyse how our site is used and may be used in some of our emails to let us know which emails and links have been opened by recipients. This allows us to gauge the effectiveness of our customer communications and marketing campaigns. Our Site includes links to other Web sites whose privacy practices may differ from those of TellTrail Enterprises Limited. If you submit personal information to any of those sites, your information is governed by their privacy statements. We encourage you to carefully read the privacy statement of any Web site you visit. When we collect personal information directly from you, we follow generally accepted industry standards to protect the personal information submitted to us, both during transmission and once we receive it. No method of transmission over the Internet, or method of electronic storage, is 100% secure, however. Therefore we cannot guarantee its absolute security. If you have any questions about security on our Web site, you can contact us at data_protection_officer@telltrail.com.